Both automakers have had their fair share of controversy, so which is the better investment option? Think long and hard before answering that question. Tesla, Inc. (NASDAQ:TSLA) is a money-losing electric upstart with an exciting business and huge growth prospects. Volkswagen AG (NASDAQOTH:VWAGY) is an entrenched auto industry giant that has been performing relatively well recently. Which is the better buy today? The answer isn't easy, and as it turns out, both have their challenges. Tesla became public in 2010, and it has yet to turn a full-year profit. That makes sense, given it is still building its business. However, the cash burn at the company has been intense, with free cash flow deeply in negative territory over the last several years as the electric-car maker tries to ramp up its Model 3 production. Tesla has had to rely on capital markets to fund its business, with its long-term debt growing from around $580 million to $9.4 billion over the last five years. Although capital markets have been willing to step in and cover Tesla's cash flow shortfall so far, there's no guarantee that will continue to be the case. That's especially evident when you look at the Model 3, which is supposed to be a mass-market vehicle with a $35,000 price tag. Right now, however, Tesla is producing and selling higher-priced versions of the Model 3 to protect profitability. This is a very big issue for Tesla. Motley Fool's Adam Levine-Weinberg recently estimated that Tesla can make as much as $12,000 per Model 3 for the highest-cost versions of the vehicle. But there's limited demand for that particular configuration, with most customers wishing to buy lower-cost versions or even just the base $35,000 model. Levine-Weinberg doesn't think Tesla can make any profit at the low-end price point at this time. In fact, he believes this is a bigger concern than the company's ongoing losses, since it suggests positive earnings may not be near at hand. Tesla has been promising investors that it can achieve sustainable profitability in the second half of 2018. Falling short of that goal, coupled with its heavy debt load, could cause Tesla's capital market access to dry up and create a severe liquidity crunch. Based on the company's recent earnings record, that's a very big risk that's just not worth taking for conservative investors. In fact, the company's cash flow issues have some of its suppliers worried that they won't get paid. Now add to these operational concerns the recent tweeting activity by CEO Elon Musk about taking Tesla private that has reportedly led to an SEC investigation. All but the most aggressive investors should stay on the sidelines. Volkswagen has been doing quite well recently, with operating profit at the European carmaker up roughly 7% in the second quarter including a one-time charge (more on this in a second). Pull out that charge, however, and operating profit was up a huge 23%. That's a very strong showing for the automaker, and probably enough to justify a closer look. TSLA Revenue (TTM) data by YCharts. 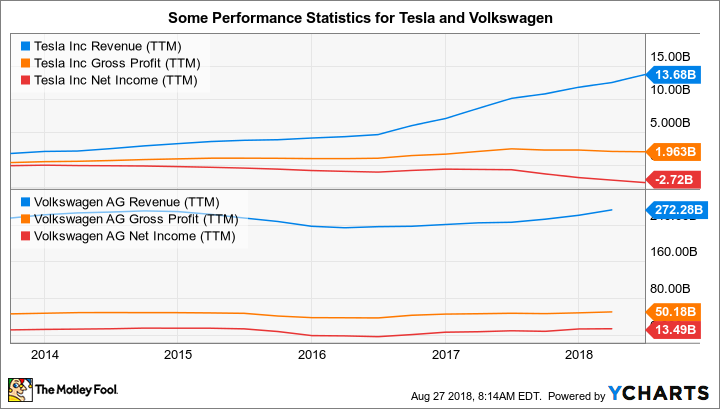 In fact, Motley Fool's John Rosevear recently outlined just how strong Volkswagen's results were in the second quarter: Vehicles delivered, revenue, margins, and profits were all up. But what about that pesky one-time charge? It was a massive 1.6-billion-euro fine related to the emissions scandal that made headlines several years ago. It served as an important reminder that the company hasn't yet moved past an issue that has dogged it for about three years now. And that fine isn't likely to be the end of the bad news. Although Volkswagen has already paid around $32 billion in fines, the scandal has also resulted in stiffened emissions rules in Europe that are only just starting to take full effect. The company is likely to spend money to comply with the new standards, and sales volume may fall due to the rules. As a result, the carmaker's second-half results are likely to be weaker than its its first-half showing. So recent performance may very well be the high-water mark for now, something that's not likely to please investors. In the long term, Volkswagen will probably survive the scandal, take steps to adjust to the market (which include working on electric vehicles), and remain a highly profitable company. The stock even looks relatively cheap today, with price to sales, price to earnings, and price to book value all below their five-year averages. However, the headwinds are not over yet, and conservative investors would probably be best served to avoid the stock until this storm has fully passed. When all factors are taken into account, neither Tesla nor Volkswagen is a particularly compelling investment today. The electric-auto opportunity for Tesla remains huge, but its execution and leverage are big issues that materially increase uncertainty. Volkswagen is a solidly profitable automaker that is adjusting with the times, but it is still dealing with the aftermath of an emissions scandal that rocked the auto market roughly three years ago. With that cloud still hovering over the European company, it is hard to get excited about its relatively low valuation. Conservative investors should avoid both Tesla and Volkswagen today.